Today I’m with a simple DIY face mask that I’m loving these days and wanna share with you guys. Since I have oily skin, large pores have become part of my life since teenage. I have tried various over the counter products that claim to shrink large pores. Then I tried several DIY, they worked but I didn’t have the time to follow the 2 step or 3 step routine. 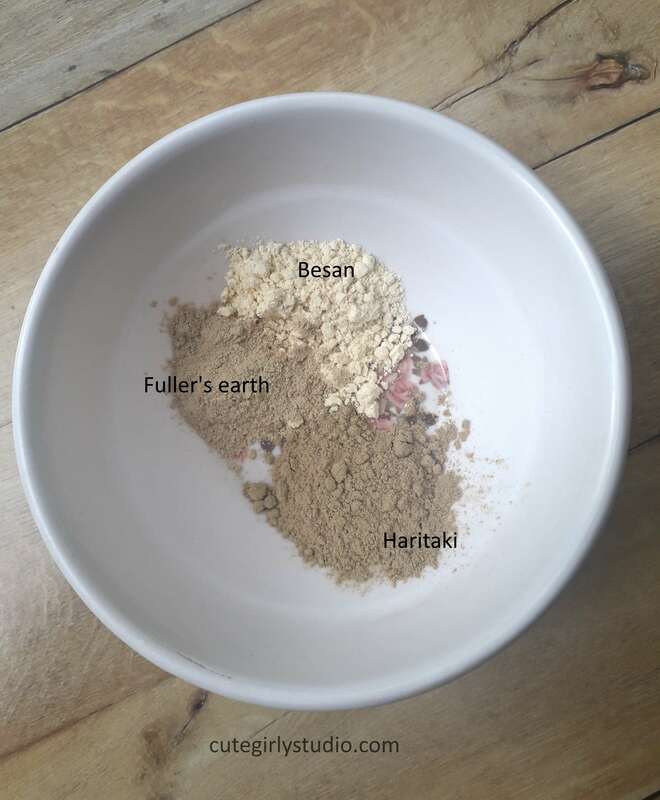 I was looking for a DIY solution that is not only effective but should also be easy to include in the routine, that is when I read about the ingredient Haritaki and I started including in my routine and I just love it’s after effects. So without any further ado let’s move on to the DIY procedure. Take a clean bowl and add the haritaki powder, besan and clay. Now add black tea / green tea to it. I’m using black tea. Mix it well and our haritaki face mask for large pores is ready. Wash your face with lukewarm water and pat dry it. Now apply this face mask all over your face and neck. Concentrate on areas where you have large pores. Leave it for about 10 to 15 minutes and then wash it with tap water. Follow it with a toner and moisturiser. Use this mask on alternate days and you can notice the difference within 2 to 3 weeks depending upon your skin’s condition. Since we want to shrink large pores, we should look for ingredients that are astringent in nature. Haritaki is one of the powerful astringent. Applying Haritaki topically helps to shrink large pores effectively. It detoxes the skin when applied as a face mask. It inhibits melanin production and has been proven to be very effective for removing pigmentation. Since it is rich in antioxidants, it prevents cellular ageing and keeps the skin blemish free. When we suffer from skin problems like acne, it greatly helps reduce inflammation and also helps treat it. Haritaki is rich in tannins. These plant polyphenols are potent antioxidants that may protect against free radical damage caused by exposure to UV light and, in turn, reduce the risk of skin cancer and premature ageing. Besan clears the skin and shrinks the skin large pores. The zinc in besan has been shown to fight the infections that cause your face to erupt with acne. Secondly, it also helps control the excess sebum production and soothes inflamed skin. The benefits of clay masks are known to almost everyone. Clay mask deep cleanses, reduces inflammation, minimizes the appearance of pores, and helps heal pimples while preventing new ones from forming. The astringent properties of the tea help to shrink the large pores effectively. Green / black tea can cleanse your pores and help you keep your skin clean and clear. Green tea and black tea contain caffeine and are super-rich in catechins and polyphenols, two antioxidants that are known to fight acne and ageing. Cleanse your skin twice a day. Use floral water or teas (green tea/jasmine tea) to tone your skin. Don’t go overboard with moisturizer. If you have oily skin, use gel based moisturizer for daytime and dry oil-based serum at night. Eat clean. Don’t aggravate your sebaceous gland by consuming oily foods. Don’t strip your skin with harsh cleansers. Try to use gentle and ph balanced cleansers. Following the above tips along with the face mask helped to the shrink large pores. 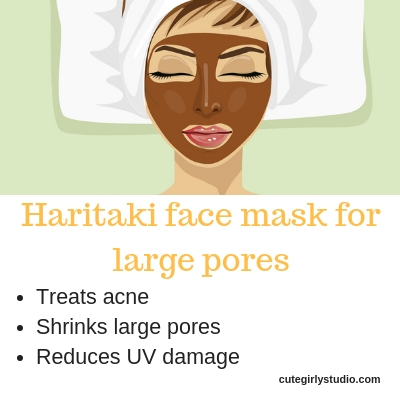 Have you tried Haritaki face mask, if yes do share your thoughts in the comments below.